There are a couple of ways you can help Angels4Epilepsy continue to deliver gift bags and more to children. We have a PayPal link to the right of the page and donations are tax deductible as we are a registered 501(c)(3). 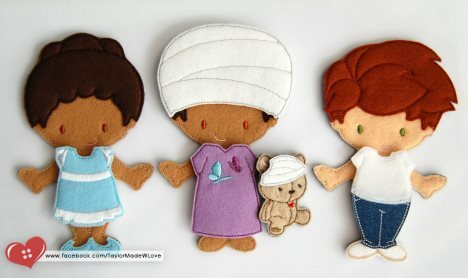 Also, our latest collaboration includes these adorable felt dolls with all the information below. We also accept donations of other items such as stuffed animals, coloring books, books and more. We can include your name or business with each delivery as well. Children love to play with dolls and they love dress up but sometimes playing with an actual doll can be difficult due to circumstances with a particular chronic condition or where the child might be confined. 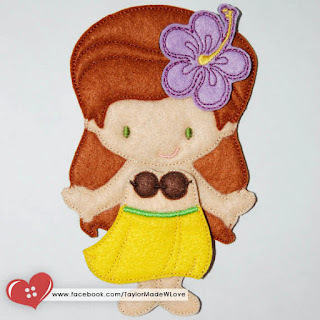 Paper dolls were always fun but they are not durable, which is where felt comes in. 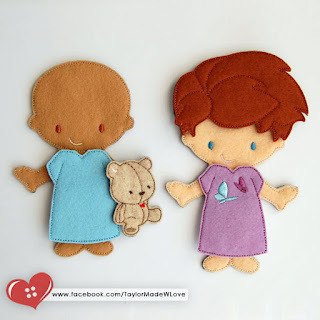 Felt paper dolls are a fun way to give children something to do, especially while sitting in a hospital bed or waiting for an EEG for seizure detection. With a bit of velcro, they make a great way to allow children to play. Angee from A Bit Creative and Aimee from Taylor Made With Love ~ Inspired by Zoe didn't stop there with designing and creating the digital design files of adorable dolls for children to use with an embroidery sewing machine, rather they created a new set that helps children with pediatric cancers and children with epilepsy feel special and helps to raise funds in the process. The digital design set for epilepsy is offered in two boy versions and two girl versions, with clothing to include shoes, pants, shirt, hospital gown with Angels4Epilepsy butterflies on it, an EEG cap and a Jamie bear that also has her own cap. The flexibility with these dolls and Jamie bear is that they can be dressed up to accompany the child when he's ready for his own EEG. $5 from every epilepsy felt doll digital design set sold will come to Angels4Epilepsy to help us give back to keeping Jamie's vision going. The $5 will be used to purchase finished dolls to be included in hospital deliveries (see below on how to purchase a finished doll). All artwork for the Angels4Epilepsy fundraising project was donated from A Bit Creative by Angee Perry. The digital design set for pediatric cancer is offered in a beautifully bald boy and girl version with clothing to include shoes, pants, shirt, hospital gown with Angels4Epilepsy butterflies on it, 2 boy hairstyle wigs, 2 girl hairstyle wigs and a Jamie bear. The flexibility with these dolls is that they can be dressed up to accompany the child while hospitalized and then dressed up with a wig when they're ready to go home. $5 from every pediatric cancer felt doll digital design set sold will go to St. Baldrick's, where 100% of every dollar raised is invested in the best possible childhood cancer research, with research funding priorities set so that every dollar makes the greatest impact possible. $5 from every pediatric cancer felt doll wigs set, designed to work with the pediatric cancer dolls, will also go to St. Baldrick's. All artwork for the St. Baldrick's fundraising project was donated from A Bit Creative by Angee Perry. There are more dolls, wigs, clothing and accessories digital design options available at Taylor Made With Love ~ Inspired by Zoe for those who want more! 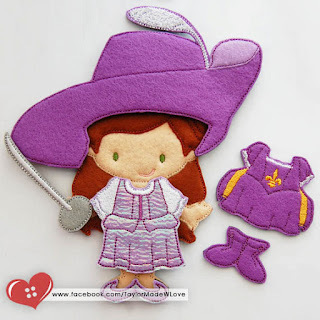 For those who can't use the digital design files that work in an embroidery sewing machine, there are finished dolls, wigs, clothing and accessories available with Melissa from Izzy's Embroidery Bow Boutique. The finished epilepsy and pediatric cancer dolls are available for $20 each, with $5 from each epilepsy felt doll going to Angels4Epilepsy and $5 from each pediatric cancer felt doll going to St. Baldrick's. The $5 proceeds donated to Angels4Epilepsy will also be put in a fund to purchase future finished dolls for Jamie's deliveries to hospitals. Whenever we can move forward and provide another opportunity to bring smiles to children hospitalized, we know we are growing. We hope to be able to provide these adorable epilepsy dolls in our hospital deliveries as well as provide to EEG technicians to give to children after they have had their EEG as a reward for being such troopers.